This past thursday my Bible study group had a prayer night. One of the things I felt a burden on my heart for was our internet connection speed. It was truly pitiful. Has been for years, but from another perspective it is SO MUCH faster than it had been in years past. But I decided instead of worrying about it, there truly was nothing I could do.... I said 'group, TODAY, I declare I will start praying regularly about our internet speed, I want it to increase in speed, decrease in price, and I'm not going to stop praying until that happens'. Friday morning I sent a speed analysis to our ISP. He's ignored every analysis for the past 1.5 years. I've been working very hard to get him to become convinced there was a problem. So I sent off this analysis with little hope. Friday afternoon I met with people who were also his customers who LOVED the performance and couldn't figure out why we did not. Sunday I got an email 'we found the problem, the NIC was giving CRC errors'. Monday I ran my test again, we are currently the fastest we have been in 1.5 years. FASTER than we've ever been with this ISP. We're seeing a full 2mb down and 1mb up this morning, as compared to our normal 400kb down and 300kb up. I told you before I LOVE how he relishes answering prayer. I had prayed before over this, but never publicly. Part of me wonders if God was waiting for me to humble myself publicly to my bible study group and say 'Okay let's begin getting serious, God is the only one who can fix this now'. Pray with me that it remains healthy... but today... today I am very hopeful and encouraged!!! Thanks for doing it in a way that I couldn't say 'look what I did!'. God did this. How else can you explain the ISP finding and issue they've been seeking for 1.5 years!? When blogging about the missionary condition, a quick word or two should be spoken about missing out. Sometimes folks whinge (not a complaint, not a whine, but a whinge), about missing certain people or foods. I don't whinge about missing food. And I rarely complain in general, partially because it isn't my mentality, and partially because I want to be a good example for my children. But there are times when you miss something and it hurts very deeply. 2 years ago I missed the birth of my nephew. I've also missed some intense family tragedies that I would have been there to support family through. The truth is, this is home. Living in PNG is home to me now. Home is where your heart is, and although my heart takes occasional holiday and desires to be in a hospital waiting room or in a tuxedo standing up in a church, it lives here. And so, whenever I think about what I might be missing, I let my mind also give equal time to what people here are missing, and what people here aren't missing. People HERE are missing out on the Word of God. That has extremely more importance than our lives here on earth. People not here are missing out on seeing what I've seen. Good and bad, my experiences are only partially shared via emails and blogs. BEING here is awesome, seeing God work. And so, yes there is missing out, but it works both ways. I am thankful for the people who stay and send, and thankful for the people who go. I am thankful for the experiences I get to share in, and try not to think too much about the ones I miss. I'm glad for friends who go to the ones I miss and update me, and hopefully I can update them as to what is going on here. And so, I don't really 'miss' much for long periods of time. I don't let myself think about it, I don't let myself become negative or complainy. I have spent some time away from here, and I can tell you it was very great to get back. If you think about it, everyone is missing out on the exciting parts of everyone else's lives... it's only very rarely that we get to share something incredible with someone. Living here, I get to share something incredible with my family, with all of you, and one day, I hope to sit and share with folks in heaven about it. There really is no cause for sadness with that perspective in mind. I have to issue a correction to an earlier blog post entitled 'Only You'. My information about me being the only who who 'could' fix it sounded far too much like tooting my own horn. The truth is that is what the Doctor said, but possible he was being too kind. I've heard from co-workers who wanted a second shot at it but the Doctor hadn't returned. I work with a team of staff, very good at what they do. I think that goes unsaid. I've always surrounded myself with people smarter than me so that I can raise to their example, and this team is no different. We are fortunate to have many skilled people here doing their respective jobs. It is one of the most interesting parts of living here, seeing how the body compliments each other with their different talents, and as a whole we are able to accomplish the work God has given us to do. There are moments when it definitely seems like only 1 person can do the job, but even that one person needs to rely on a team of people to get anything done. and then at other times He reminds us that we are very replaceable as His resources are infinite... and we're honored to be the ones He chooses to currently use. I'm very thankful for my co-workers and teammates and their abilities and talents. This is Jonathan. He's the main I.T. 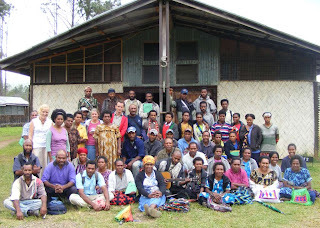 guy for a mission's organization in PNG completely operated by nationals. We met nearly three years ago. ARound that time many of us asked the question 'how are other IT professionals in this country doing this?' and we pulled together a meeting of all the IT minds in the country that were able to come. Jonathan showed up as the only IT guy for his small mission. During that meeting and meetings since, we've all pooled our thoughts and solutions and created a resource in and of ourselves by simply having a meeting of the minds. During that first one several years ago, Jonathan walked away with a new resource. We had started an email list between us. We all had a new resource. Since then Jonathan has written us and asked us questions. Many of which were things we could very easily help him with. 'How to install a windows server' or 'how do I configure a workgroup'. Today he reported they have their first ever windows server up and running and he has 2 other IT techs working with him. It is important to recognize that Jonathan represents a cultural oddity. His love for spreading the Word of God is mixed with his iniative and desire for learning. It is a pleasure to have helping him be a side effect of our ministry here. It is so hard to answer the question 'what do you do?' because of the mere fact that we say 'yes' to God, he creates all these little side effects of service that you hadn't anticipated. The fact that we are here, is a resource for people like Jonathan. He's a neat guy with a huge task, and it's a pleasure to be able to help him. Ever come across a problem and say 'well There's yer' problem' and then realize it was something you did years ago? 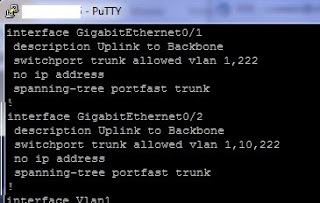 Yesterday I spent some time troubleshooting a network connection. What we have been trying to do, and have succeeded at doing, is to use 1 wireless access point, and give multiple SSID's. What this means is that say you go into a starbucks, and join the free wireless there, it isn't really that secure and most people know not to do sensitive things on their computer there. Well, the past 6 months people have been asking for more and more wireless access. Wireless here is really unpredictable because of all the metal in the roofing and walls. Anyway, after a steep learning curve, yesterday I finall figured out how to make 2 wireless networks work over 1 wireless device. A configuration in Microsoft NPS (aka Radius). it was working... in all placed but 1. So I sat down yesterday, it was quitting time, but I couldn't let it go. Why go home with questions in your head? PAST CHAD.. Chad from 3 years ago, typed a command for security that was breaking what CURRENT CHAD was trying to do . I was blocking out Vlan 10 with an allowed statement... on purpose. Which I now wanted to UNDO. So I undid it. Anyway point is, I know I'm geeking out here, but the point is, it works now... and I will be deploying these WAPS across the entire center today! Which means tomorrow a whole lot of people won't know how to connect to the wireless anymore which is why I created a video tutorial on how to join. In fact, apparently my reputation for documenting things got all the way to the director who has asked me to join forces with him in an attempt to create a training curriculum for Papua New Guineans. I'm pretty excited about that, and have been doing a lot of documentation and videos lately gearing up for that. We do a lot of training and there needs to be a lot of repetition in that training for PNG'ians to remember it. So video would be perfect for that repetition! Anyway, I've been playing with it in my spare time for now because my manager while approving of the idea, doesn't like the time it takes to do video, which distracts from my other priorities. Still, I'm rather passionate about this so I don't mind it cutting into my after-hours time. -If I fix a computer or a network, then the translator can keep on translating, the teacher can keep on teaching, the church leader can keep on discipling. -If I train people to do things - then they can keep on doing their jobs even when I'm not available. So here is an encouraging story (it encourages me). When we got here a few weeks ago I went in for a health checkup with the doctor here. The Doctor said that since I was there he'd ask me a question. He purchased a handheld device (HP Ipaq with windows Mobile) and he enjoyed using a software called Epocrates. He said he had spent countless hours with several other CTS (computer dept.) guys who all said 'well I can't get it to work, your only hope would be when Chad returns'. 1 hour ago I had no idea what 'Epocrates' was. I had and still have no idea exactly how the Ipaq PDA works. But the doctor has a working piece of software that tells him about medications and treatments. He is very thankful to me, and I'm thinking 'this is AWESOME!'. It was a simple solution, I verified that there was some issue with the network on his laptop and the sync software, bypassed it and sync'd directly to his handheld. After which he said 'I should have bought an iPhone'. For me, the fact that I was able to get this working is hugely affirming to me. I took what I know (thanks God) and applied it to what I didn't know, and tested a few things and it ended up working. Now the entire community can benefit from the doctor having access to up to date medication information. And I get the bragging rights of being able to say 'I'm the only guy on center who could get this working for him'. But what feels even better than all of that... pride and ego aside, is that another doctor recommended me to this doctor to fix his issue. I've made an effort to learn things that I feel are needed here but that other people don't understand. I've learned all kinds of old and new technology for 1 reason. My ministry here is to make it so that people feel confident that if they come to me, it'll end up working one way or the other, and so they can concentrate on THEIR job rather than being constantly frustrated that a tool they need isn't working. When I can directly impact the community in this way, I feel so much affirmation that I'm the guy God put here. So I'm very thankful for these moments where I realize... yes God put me here, God gave me the skill and brain I have... and I am soooo thrilled to be involved in the process. I was raised in church ministry. My mom served, my dad served, both me and my two sisters served, for years. It is my opinion, that people who serve often get asked to do many things because they exhibit a servant's heart. Often times, on the WORK side of church unless servants can learn to say 'no' they can very quickly burn out. 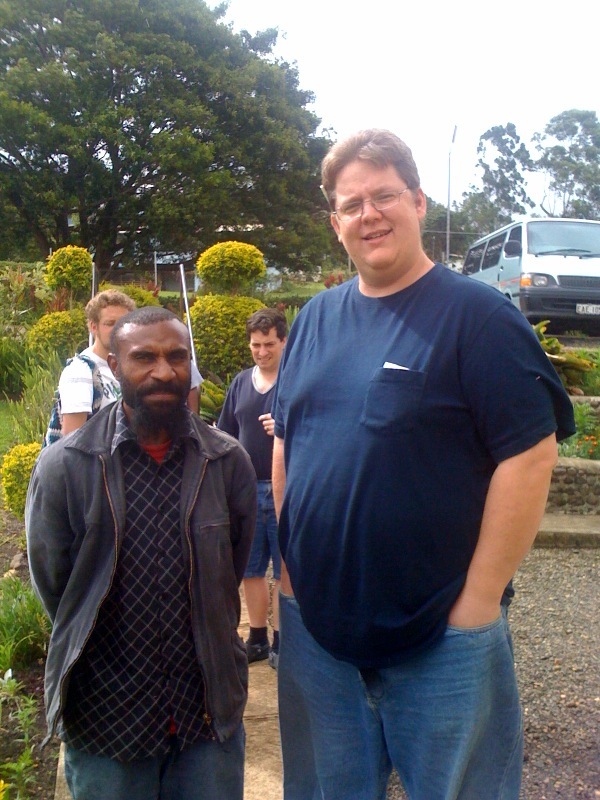 Here in PNG, saying 'YES' to one ministry often means saying 'NO' to others. There really is never the risk of 'I'm not doing enough for God' here. Both Kendal and I are constantly busy doing some ministry. We have our main jobs plus many others. So when a new opportunity arises you have to seriously consider it, pray, go to God and ask for guidance, because you can very easily end up in a position where you get burned out. There is SO much work to be done and the workers are diminishing. -My wife was asked to become a 5th grade teacher instead of preschool. -My wife was asked to be a committee secretary (a huge amount of work). If we chose to say 'yes' to these things, we would be effectively saying 'no' to many many things in the next 2 years (that's the length of the committment). And so, we seriously sought God in this matter. Praying hard over it. People don't ask lightly around here, your 'NO' has to be firm, which is why I needed the confidence that God was directing my steps behind me. After 8 days of prayer and thought, God graced us with a very clear message and we replied 'NO' to these things. The NEXT day my world got super busy and I realized... had I said 'yes' at this point I possibly could crack. The readjustment to this place has been very time consuming because there has been so many changes and there is so much work to do. I mention this because I firmly believe that for the sake of longevity that people serving God must learn to say a very firm 'no' in a loving way. You need to learn to deal with the guilt of not taking on a task that God has not called you to, and the guilt of saying 'no' when you see an obvious need. We need to also learn that when we say 'no' we need to start praying for that hole to be filled by the right person. Putting the wrong person in a 'slot' can be as harmful as leaving that job undone. I've seen ministry chew people up and spit them out. And ministry can be a machine. A machine with a heart that does good work, but the ugly side of it requires that people fill roles and jobs. It may sound dreadful for a missionary to say 'Today I said no to three opportunities to serve.' But that should really be read as 'Today I said 'yes' to doing what God called me here to do, and to do it well, instead of doing it distractedly until I get exhausted and burn out.'. We're not here to work super hard, then fall apart within a year. We're here to work hard, work smart, and do what God called us to do, and to do it for the long term. However, if you're unclear what God is telling you to do, then saying 'yes' to many things may help you to find your niche. Please don't take this to mean we're not doing enough. I've listed out before all the things we are doing. Instead this post is to inform you that there is a ton of work that gets left undone sometimes. We prioritize and focus and get the job done. I wanted to express that there is so much work, that as soon as someone returns from furlough/home assignment they are prompted with many new 'opportunities', and you need to learn the discipline of wisely accepting the ones you are capable of doing well. It's all about maintaining a manageable level of stress and energy in your life so that you can serve over the long term with passion and skill. On the flip side, I totally intend to arrive in heaven completely used up, beat up, and tired out. I simply don't want to burnout before that time. My blog title 'the poor' was not meant to be posted with that photo, I made an edit and forgot to change the title. The edit I made was to delete my posting about the poor in this country. But I left the photo. The question I was posing to myself publicly was how to define 'the poor'. In a country where you can grow your own food, are people who aren't starving poor? What if they aren't starving but develop malnutrition when older? What about AIDS being a huge problem? No cash money, but a cultural system that helps them provide for each other? When Christ asks us to tend to the poor, where do we draw the line and once drawn, how do we tend? We strive to bring the Word of God to people of PNG. We also strive to meet them like Christ met them, caring for their physical needs as well. Anyway... those are the thoughts I deleted and why that picture was entitled 'the poor' accidentally. When I've processed this more I'll share more. The tug on my heart lately has been to do a little more than we did our first term here... and I have some ideas about how we might achieve that, but it's not really what we're doing. It's what the Spirit of God wants to do through us that matters. for that matter, a blog seems almost boastful if you talk about what you're doing. Although we need to communicate to people what we're doing... but wouldn't it feel like bragging if you say..
"Today I helped a blind man..."
the point of this blog is to document life here, our transition and lives as missionaries and to communicate what God is doing. So I want to be clear here. If I get excited about something we're doing, it is because I'm boasting in the Lord and what He is doing. I've tried doing things on my own without God's leading or intervention and it doesn't turn out as well as you'd hope. So whenever anything remarkable happens, it is very obviously God working. So when we work out this question about the POOR, we will let you know what happens. this is a picture of the village area some of our Bible translator friends live in when they are in the village. implement a technology I've never used of using principles I understand. Today was one of those days when you say 'I THINK this should work, but I don't know HOW yet'. And you dive into manuals. And at the end of the day I had to battle my training and what I already knew to work, because I simply didn't like the ideas coming at me... but they were valid ideas... and after much trial and error and reading, and testing, I believe we reached success. They got their product working. The problem with changing the 'default' way of equipment is that it becomes harder to replace me in the future. The problem with keeping 'default' configurations is that they are insecure and quickly become disorganized. I documented it all today and pretty much wrote a ten page manual with pictures so that the guy behind me could learn it too. Last night I didn't sleep much. I was considering this decision about leadership I mented a few posts ago. I spent my non-sleep time praying and a peace came over me as I realized that I needed to spend my energies elsewhere. So I was calmed by that, wrote out a list of priorities and decided to go about my dad tackling the challenge. We had a meeting today about the projects we need to do in 2011. The list was 28 items long. Each item was a month worth of work... if things go well. It's a VERY long list. It is a TON of work. I am so very thankful to God and to you all for praying for me, that I was able to come to a decision this morning about the leadership thing, and have a confidence that God had something in store for me... and then to come to work and find out WHAT He had in store. PLEASE pray these go well, we'll be busy enough without distractions and failures. Most of the work is inspired by the Microsoft licensing issue I told you about. We have to shave down, simplify, and otherwise reduce costs. And we have a year to do it in.. actually, until June. So half a year. Because once June hits, we will lose a few guys and won't have the man power to do the projects for 18 months. I'm so glad I got some energy on furlough, these projects strike me as a lot of fun! This isBeverly, she's a translator missionary working with the Onobasulu people. I enjoy her insite on things quite a bit. She has a good send of humor and a great spirit. I've worked to help her with email, laptop, and radio issues quite a bit over the years. What is God doing this week? Scripture use and leadership training course. This weekend is the one weekend between the tweo week course happening here where we live. I support the network for the teachers of this course but it typically a somewhat low tech course, occasionally laptops are employed with wireless networking. I have setup an infrastructure for such classes that when working properly means things just work. Which is good. The upside to things breaking is I get to interact more with the people attending the course, but typically things don't break. About half of the instructors are missionaries and the others are church leaders from the valley. Please pray for the instructors and the almost 50 participants, as they are in training to be SALT in their churches and villages. as always you can pray for peace in the valley and for God to have a huge impact. Church leaders in this area have a tough task as there is almost always conflict between different family lines. (aka tribes). Church leaders are constantly throwing themselves in the middle of violent conflict to bring peace and apply God's Word. These courses give them skills and tools to employ God's Word among their people to see it change lives. Wow, I've never been one to celebrate something on the weekend AFTER the date.. I've always thought the date should be sacred itself. But in this instance we decided to celebrate our anniversary last night instead of on Weds. As a result we sort of got an anniversary week. Thurs night our Bible study sang us a song and made us a special dessert. Kendal made a special meal, we sent the kids to friends house and spent a very nice date night at home just the two of us. She made a very tasty chicken pastry dish... and an apple turnover dessert! We played her gift, which had a toy 'crystal' in it (not new age, it was a game called Forbidden Island... part of my attempt at having more family games to play. So technically I gifted her the appropriate 15 year gift. This week at work was busy. But I was honored to have the chance to fix a few issues for a neat lady translator from Australia. She told me her village home was finally eaten by white ants... it took them 10 years, but the house was demolished. I am often honored by the fact that my skills and talents can be used here to further God's kingdom. Still I desire to do more... I've been praying lately for God to show me more opportunities to expand His kingdom and a few names of nationals have come to mind now. So I've begun praying for them and trying to get my mind mind around how a man witnesses to a woman in this culture, I'm pretty sure I can't directly so I'm thankful I have a wife who works with me in a team. Which brings me back around to the 15 years. When I got married 15 years ago, I knew it was to a wonderful young woman who had such potential, and in 15 years I've seen her mature into an incredible woman. She's in her prime now, confident, able, settled, assured of her skills, still learning, Godly, loving.... an excellent helpmate and teammate. I am sometimes unsure how she knew 15 years ago I wouldn't turn out to be a jerk, but then it dawns on me that both of us were trusting each other and God to work in us, and who we are now, is not who we would have been without God and without each other working in us for 15 years. I know I'm a better man for having married her. I'm thankful to my wife and I'm thankful to God for 15 years of happiness. I have never once felt like marriage was a burden, and have always found my wife to be the kind of person who lightens a burden tremendously. It's been at good, if quick, 15 years. Cairns, Australia has been hit by a category 5 cyclone. The biggest in it's history. We have friends there, we also have a plane there waiting on repairs. A quick prayer for protection would be appreciated. Cairo, Egypt has been undergoing some incredible violence through protests. I saw some of the news footage last night and it was incredible. We also have friends there we haven't heard from for a few days as we heard they were evacuating all Americans. a quick prayer for that would be appreciated too. Today's lunchtime was a little odd. -flywire (screen) over my face, and tied at my neck tightly with a rope. (because if the bees get in... they're stuck in flying around my face. Then I battle the bees. And they move on or die or both. Typically they move on to another place around my house and I find this out in a few days.. and we go again the next weekend I have. I had all but obliterated them before furlough and today I find out, the hive is bigger than ever. Big enough to be dangerous if we or our kids were caught up in it. So the fight rages on. Seems like there are a lot of things like that keep popping up right now. I'm tired just thinking of my 'todo' list. While I was outside, a man Mayas came up to me to 'stori' which means sit around and talk. I didn't know him, and I had to get to work, but culturally it would be rude to run off, so I decided to be a few minutes late to work. After all I'm here to spread the Gospel to people, not punch a clock. So we talked for a bit, he was very nice, offered to even help me with my bees. We debated over whether or not smoke killed bees or simply put them to sleep. He told me the best way was to make a small fire, put paper on it, and smoke the bees into leaving. I told him I didn't like fire close to my house, and that the smoke would more or less make them sleepy but not kill them. Anyway, he asked me if he could take a few garden cuttings, and then said he could trade me for some others, and I told him if he saw something he liked, to come talk to me later... he said he would. After thinking of the conversation, there was no exchange or askims (favors) which is typical. I think Mayas was networking, making a relationship, offering friendship. Those types of interactions are pleasant to me because you get into a bad habit of waiting for someone to get around to asking you a favor, but he never did... not yet anyway. So my lunch break was atypical, but enjoyable. Thinking it would be a rather simple anniversary without much pomp... just a quiet home cooked meal.... we woke up to these pictures. The kids woke up early, dressed, set a beautiful table complete with flowers and linen, made cards, wrapped gifts and cooked up eggs and toast. Have I mentioned before I LOVE my kids being older! We have loved every year of our married life, and have loved every stage of having kids. This morning they blessed us big time with a huge surprise, as we came out of the bedroom this morning... BOOM a really gorgeous table setting! and thanks Kendal for 15 great years! p.s. for our 10th and 15th we've been in places where we needed to keep things simple and yet somehow, we have been blessed with remarkable anniversaries. Not remarkable because they are complex or pricey, but remarkable because something special happened that we'll never forget. And what the kids did this morning for us, we'll never forget. IT was well done (they had tried things when they were younger but they were not nearly as well executed as this time).